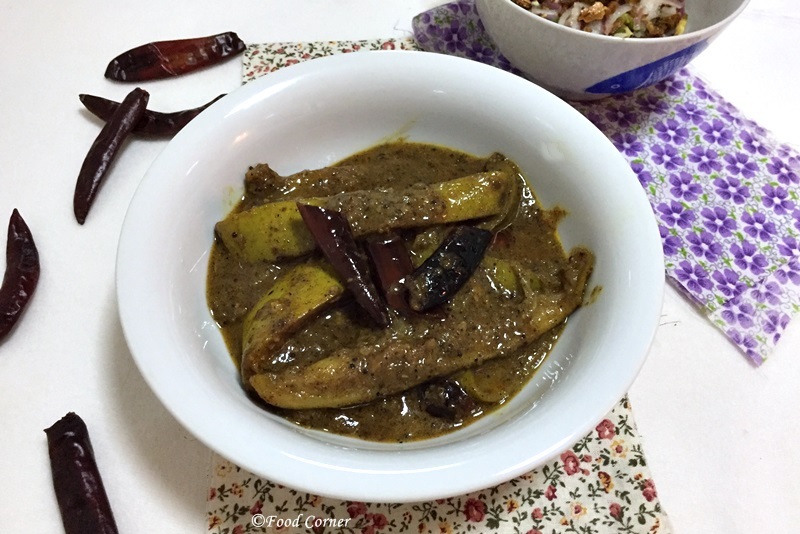 Do you like to know how to cook a finger licking good fruit curry from Sri Lanka? 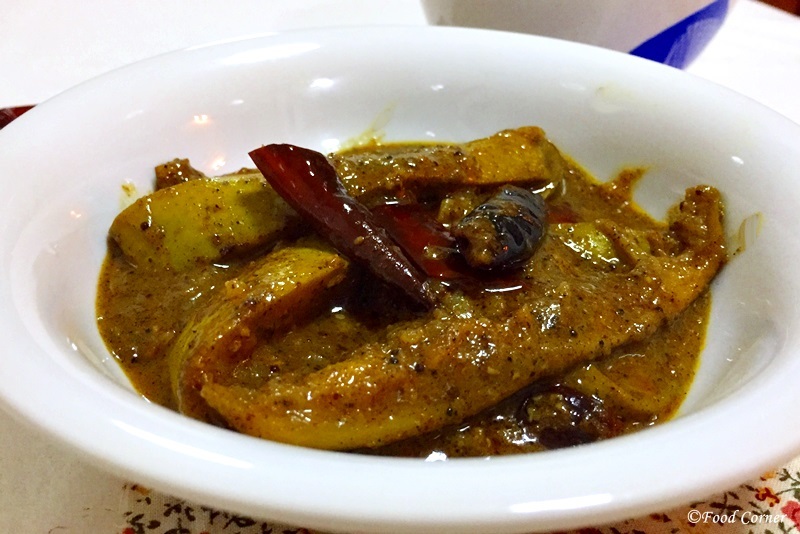 Then this Sri Lankan raw mango curry or Amba Maluwa will be the ideal recipe for you. Call it as raw mango curry or green mango curry; this mango curry will add flavours for your Sri Lankan meal when you eat with other sides. 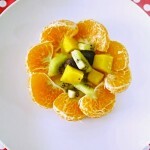 In Sri Lanka, we cook many fruits in curries or even in salads. Other than Mango there are many other fruits that give us delicious curries which are unique to Sri Lanka. Pineapple, Ambaralla and banana are some of the popular fruits that we cook as curries in Sri Lankan cuisine. 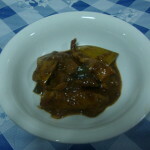 You can’t forget the famous polos curry which we cook young jackfruits as a curry! Anyway, that’s all about how Sri Lankans cook raw fruits as curries. 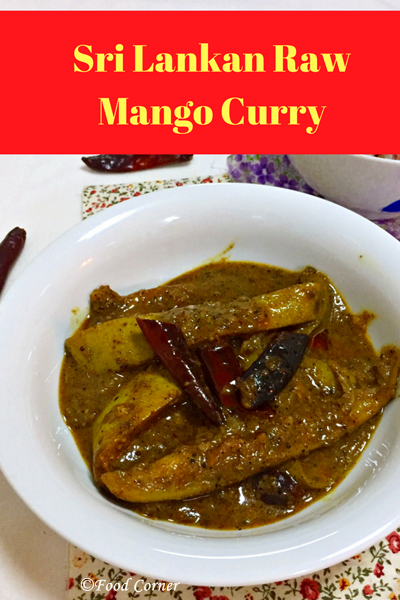 As I have shared most of the popular Sri Lankan recipes with these edible fruits, I thought of sharing this raw mango curry recipe which I cooked few days ago. You need raw mangoes to cook this curry. However I prefer to use slightly ripen mangoes to avoid the sour taste. Also by adding some sugar, you can balance the taste without making it as a sour curry. Below is the recipe I use for cooking raw mango curry in Sri Lankan style. 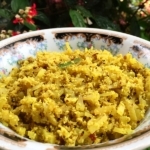 Try it and let me know how your raw Mango curry tastes! Heat a pan and toast the fresh coconut until it turns golden brown. When it turns to brown, add rice and roast together. Remove from the heat when the mix is golden. Add that to a grinder. Now roast other spices under Coconut & Spice paste ingredients list. Roast till the spice colour is brown. Remove from the heat before it gets dark/burn. Add to the same grinder that toasted coconut is in. Grind all until you get a smooth paste of a coconut and spice mix. Wash and cut raw mangoes into big pieces. Keep those in a pot and add all the coconut and spice mix. Mix mango pieces with spices and keep aside. Also slice the onions. 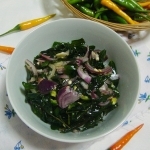 Wash other ingredients such as red chili and curry leaf before cooking. Add cooking oil to a pan and start cooking. Add mustard seeds when oil is hot. When mustard seeds start popping, add onion. 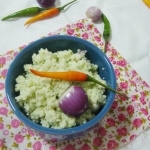 When onion turns to brown and start emitting aroma, add garlic and then red chili and curry leaves. Fry till the mix is tempered well. Then add raw mangoes which we kept aside. 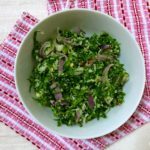 Mix well and cook for few minutes. Also add other remaining spices/herbs such as cinnamon piece. At this stage, cover the pot with a lid. Cook for few minutes in a very low heat. Then add ½ cup of water to the mango mixture. Mix well. Cover and cook in a low flame till mango pieces are cooked well. When mango pieces are tender and cooked well, add coconut milk. Add sugar.Adjust the salt. Simmer for another few minutes. Sri Lankan Raw mango curry is ready to serve.